The World Baseball Softball Confederation (WBSC) and the International University Sports Federation (FISU) have appointed Sujeewa Wijayanayake as an official umpire for the FISU World University Championship which began last week in Chiayi, Taiwan. Wijayanayake, a former Baseball coach of Ananda College and a qualified international Baseball umpire in Sri Lanka and Japan, is the only by two countries in the world. Wijayanayake, is also a qualified international umpire of the Baseball Federation of Asia (BFA) and the WBSC, and is the only qualified international umpire from West Asia. For the ongoing tournament, he is the only umpire nominated by WBSC and FISU. Other international umpires in the competition are accompanying their respective national teams. A Baseball fanatic, Wijayanayake has officiated at top level prior to his present assignment. 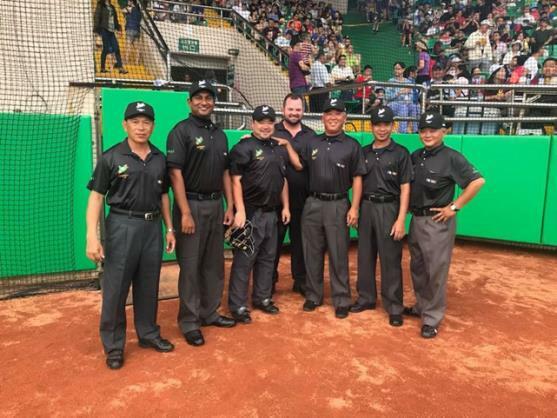 Among the final matches he officiated are the WBSC Baseball Open Championship 2017 in Hong Kong, between Hong Kong and Singapore, the BFA Asian Championship 2017 in Taiwan, between Japan and Taiwan, the FISU 29th Summer Universiado Championship 2017 in Taiwan, between Japan and USA, the FISU 28th Summer Universiado Championship 2015 in South Korea, between Japan and Taiwan, and the BFA East Asia Baseball Cup 2015 in Indonesia, between Indonesia and the Philippines takes centre-stage.